The charro has horse riding in his soul, is wild at heart and considered by many as one of Mexico's most recognizable elements. Dressed in traditional garb with a jacket, boots, a sombrero, a tie and chaps, his image is known across the globe as a proud symbol of the roots of Mexican culture. Closely related to ranching, charreria is a competitive rodeo displaying a beautiful combination of control of the horse and the rider's lasso skills. It could even be considered an extreme sport, not for the faint of heart. Charreria is especially popular in Guadalajara, as well as in parts of central Mexico like Toluca, Pachuca, the outskirts of Mexico City, Queretaro and many other towns. The sport of charreria has evolved in a unique way since colonial times, when only Spanish leaders were allowed to ride horses. This noble creature was a jealously protected status symbol until permission was granted to mestizos and trusted hands working on large haciendas in order to complete ranch work. Charreria as it's known today was born in the state of Hidalgo in the 1550s, when Sebastian de Aparicio taught the men on his hacienda in Careaga how to tame horses. Soon, the sport called for its own form of dress: a uniform that would set charros apart from the common workers on the hacienda. As the centuries passed, charreria became a display of bravery and lasso skill, with a huge upswing in popularity during the presidency of Porfirio Diaz. It was during this time that the art was shown in different parts of the world like New York and Paris. In the 20th century, it became an official sport of Mexico. During charreadas (charreria shows), the charros compete in different events to show off their horse control, their bold moves and even dangerous acrobatics. Among the most exciting tricks are the Death Step, the Taming of the Mare and the Skirmish, along with the Leg and Horse Lasso. 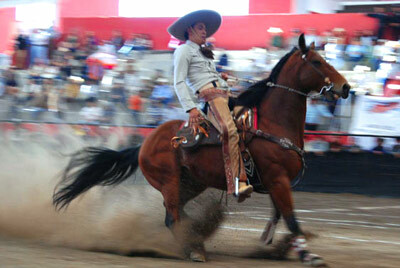 Kids and adults alike will love viewing the tricks of Mexico's daring horsemen. The National Federation of Charros is in charge of coordinating the most important events in Mexico to continue on with this incredible tradition. Whether it's a huge parade or a traditional fiesta anywhere in the country, the sight of a charro in costume can transform any event into an unforgettable experience.